by the press in 1984. 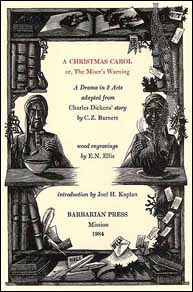 Many of the titles published by Barbarian Press in the past are now out of print. However, since you may be interested in having a broader idea of the range of our publications, we are providing descriptions and publication details of some of those titles here for your perusal. Please note that these books are all OUT OF PRINT: this is purely a museum of past work. Select a title from the list to your left to view a description of the book and photographs of some pages and bindings.